The eight foot falls at the head of beat 9 in full spate. A breathtaking sight but not about to daunt one of our returning residents. 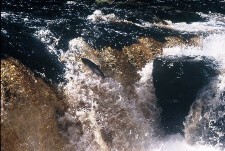 On the day this photograph was taken ( mid July 2005 ) 22 Salmon and 27 Sea Trout were counted going up the falls in 15 minutes. They are certainly back. This is a long beat with a big powerful straight at the top ending in a more complicated lower section. The top of the beat is right beside the road bridge and the first pool is right there too. A very popular spot in a spate. 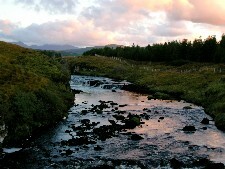 Looking upstream on the top beat at sunset in low water conditions. In a spate it's heaven - so many good pools. The beat is about a mile long and is preceded by an un-numbered beat made up of about a third of a mile of flats. Sea Eagles can often be seen cruising this end of the river as well as many species of smaller birds, the occasional Otter patrolling the river and its banks or the red deer coming down to drink at dusk. Here's a shot from the top of one of several gorges which can be found from Beat 8 to Beat 12. 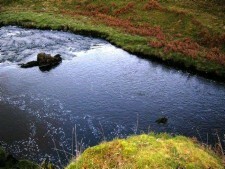 It can be entertaining to drop the fly 25 feet or more between the two rocks below and then make your descent whilst playing the fish.